When it comes to training babies, pre-toddlers, and toddlers, parents often fall in one of two camps of thought. One camp is a bit in disarray because the parents don’t really want to push moral behavior before the child can conceptualize why behavior is not okay. So the child sometimes is not allowed to do something and other times is allowed. This leads to confusion and frustration–especially frustration from the parents because the child isn’t listening. The other camp is a bit frustrated because they want the child doing things for the “right reasons” and wants the child to want to obey. It is frustrating for the parent because children of this age group cannot understand morals, so there is no behaving for the wrong or right reason–it just is or isn’t. Both of these camps miss the mark. 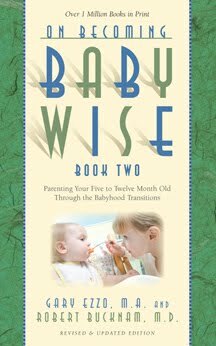 “Young children do not have the moral means to create or respond to right and wrong” (On Becoming Babywise Book Two, page 21). So our second camp is aiming for an unachievable goal. But that doesn’t mean we just wait until they turn three and start to understand morals. “This does not mean, however, that you suspend the training of right responses” (page 21). Don’t wait until later. He may not understand why he shouldn’t throw his food on the floor. He isn’t capable of thinking of how others feel when he screams in close quarters with others. He doesn’t have the empathy skills to imagine what it would feel like if his sibling hit him. Teach him to keep his food on his high chair tray. Teach him to not hit. Teach him to not scream in the house. Teach him correct behavior. When the age is right, he will understand why this behavior is right (usually around age 3). Until then, he will gain correct habits and won’t involve arduous retraining as a 3 year old. Remember the mantra of Start As You Mean To Go On. Don’t stress about teaching the why right now. Focus on the what. The why will come when it is age-appropriate. Would you have any suggestions on how to stop screaming & whining at a younger age (ei: 6 months old). I can see that this isn't how I want things to go, but I sincerely wonder HOW to go about it at this young an age. Thank you for your thoughts! When my babe is whining (7 months), I usually say, 'please no whining, we do not whine in this house', and don't give in to what she wants. Again, I suppose it is keeping with the mantra- Start as you mean to go on. Screaming is hard- because at times they are just discovering their voice. Looking forward to comments about this. Marysol,With a baby that age, I would put a finger to the baby's lips gently and say, "That's a no, we don't yell in the house (or at the table or whatver your rule is)." Speak softly and quietly. Repeat as needed (which will likely be often).You can also take him outside and let him yell and yell so he gets his yelling to a point that it isn't a novelty.You also want to consider why he is yelling. If he is yelling for experimentation, that is where taking him out works well. If he is yelling to get your attention, then working on teaching him sign language for needed things will address the yelling. Thanks Vanessa and Lauren for your ideas!